In this new board game players will take the role of rival biker gangs as they attempt the grasp control of the town using bike riding gang members and prospects on foot. The aim is to have the most money at the end of the game. 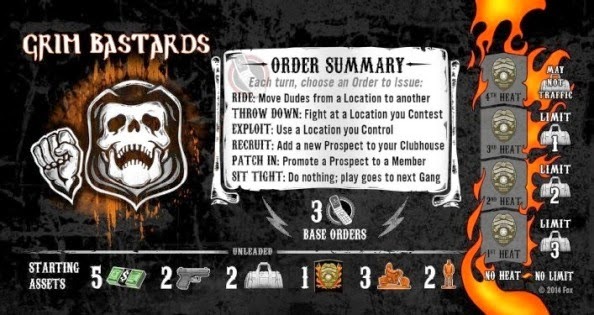 There aren’t any images of the game itself out at the moment but details have been released about the promo expansion the Grim Bastards, which gives some idea of the gameplay options. What we do know is that the game will take the form of revealing tiles to represent territories in town that can be controlled. Not only are you going to come to blows with the rival gangs over the control of these territories but there appears to be mechanics for joining forces with other gangs. The Grim Bastards are a promo club, that won't be in the final game. Men of Mayhem is the term for a Sons of Anarchy gang members who have shed blood for the club. Anyone who has watched the television program knows that this is a serious and mature setting with the murders, drugs, gun running and, ahem, ‘adult entertainment’. Gale Force Nine have already shown us with Spartacus that they can handle a mature theme and that this should be something to look forward to. As with both of Gale Force Nine’s previous games, expect this to be released at Gen Con.